Marilyn Nelson, a three-time finalist for the National Book Award, is one of America’s most celebrated poets. She is the author or translator of seventeen poetry books for adults and children, five chapbooks, and in 2014 she published a memoir, named one of NPR’s Best Books of 2014, entitled How I Discovered Poetry—a series of 50 poems about growing up in the 1950’s in a military family, each poem stamped with a place and date from the many places they lived. Of her many collections, The Homeplace won the 1992 Annisfield-Wolf Award and was a finalist for the 1991 National Book Award. 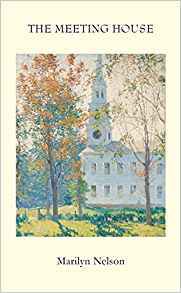 The Fields Of Praise: New And Selected Poems won the 1998 Poets’ Prize and was a finalist for the 1997 National Book Award, the PEN Winship Award, and the Lenore Marshall Prize. The poems in this collection embrace numerous themes, including the changing nature of love, racism, motherhood, marriage, and domesticity. Carver: A Life In Poems won the 2001 Boston Globe/Hornbook Award and the Flora Stieglitz Straus Award, was a finalist for the 2001 National Book Award, a Newbery Honor Book, and a Coretta Scott King Honor Book. Fortune’s Bones was a Coretta Scott King Honor Book and won the Lion and the Unicorn Award for Excellence in North American Poetry. Her young adult book, A Wreath For Emmett Till, won the 2005 Boston Globe Horn Book Award and was a 2006 Coretta Scott King Honor Book, a 2006 Michael L. Printz Honor Book, and a 2006 Lee Bennett Hopkins Poetry Award Honor Book. The Cachoiera Tales And Other Poems won the L.E. Phillabaum Award and was a finalist for the LA Times Book Award. In 2016, her poetry collection My Seneca Village won the LA Times Book Award in Young Adult Literature. She has also published books for children and young adults including: American Ace, a historical novel that uncovers a richer understanding of race, identity, and each other (Penguin Random House, 2016); Snook Alone, a picture-book illustrated by Timothy Basil Ering (Candlewick Press, 2010); Sweethearts of Rhythm: The Story of the Greatest All-Girl Swing Band in the World, illustrated by Jerry Pinkney (Dial Books, 2009); The Freedom Business: Including A Narrative of the Life and Adventures of Venture, a Native of Africa (Front Street, 2008); The Cat Walked through the Casserole and Other Poems for Children (with Pamela Espeland, 1984); and Halfdan Rasmussen’s Hundreds of Hens and Other Poems for Children (1982), which she translated from Danish with Pamela Espeland. In 2012, Faster Than Light: New and Selected Poems and Ostrich and Lark, a picture-book illustrated by San (Bushman) artists, were published. Her honors include two NEA creative writing fellowships, the 1990 Connecticut Arts Award, an A.C.L.S. Contemplative Practices Fellowship, the Department of the Army’s Commander’s Award for Public Service, a Fulbright Teaching Fellowship, a fellowship from the J.S. Guggenheim Memorial Foundation, and the Frost Medal-the Poetry Society of America’s most prestigious award, for a “distinguished lifetime achievement in poetry.” Nelson is a professor emerita of English at the University of Connecticut; was (2004-2010) founder/director and host of Soul Mountain Retreat, a small non-profit writers’ colony; and held the office of Poet Laureate of the State of Connecticut from 2001-2006. On May 17, 1954, the U.S. Supreme Court ruled in the case of Brown v. Board of Education of Topeka, Kansas that state-sanction segregation of public schools is unconstitutional. In September 1954, in an airfare base school near Salina, Kansas, young African American teacher Mrs. Johnnie Mitchell Nelson became the teacher of a second grade class of twenty white children. Mrs. Nelson knew, but did her pupils understand they were making history together? Through a class roster of persona poems by poets Doug Anderson, Martha Collins, Alfred Corn, Annie Finch, Helen Frost, Margaret Gibson, Jeannine Hathaway, Andrew Hudgins, Mark Jarman, Peter Johnson, Meg Kearney, Ron Koertge, David Mason, Leslie Monsour, Dinty W. Moore, Marilyn Nelson, LeslEa Newman, Michael Palma, Michael Waters, Katherine Williams, this anthology presents Mrs Nelson and her class, imagining how she and her students may have experienced their unique situation. In The Meeting House, Marilyn Nelson has focused not only on the history of the First Congregational Church in Old Lyme, Connecticut, but also on slavery and bigotry in a presumably enlightened part of the Union. Her dismay is leavened by generosity of spirit, the same qualities revealed in her earlier books. When will the Constitution’s racial fractions become a healthy whole? Multiaward-winning poet Nelson attempts to answer this still-vexing question. Sixteen-year-old Connor Bianchini casually believes in his family- and religion-confirmed half-Irish, half-Italian identity. Connor’s father, Tony, finds out differently when his mother, Lucia, dies and leaves him with the inheritance of pilot’s wings, a gold class ring, and a letter, in which Lucia states that Tony is the “fruit of great love” between her and an airman nicknamed Ace. 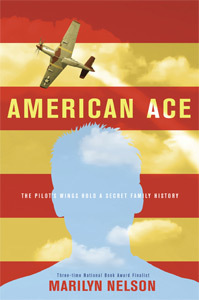 Research leads Connor and his father to the discovery that Ace’s class ring came from Wilberforce University, a historically black university, and his wings may have come from his service as one of the legendary Tuskegee Airmen. Whereas Connor embraces his “new” black ancestor, though, Tony and his other son (Connor’s half brother), Carlo, react negatively: Carlo tells his father that “bad news should be told privately,” and Tony literally has a stroke. The author’s meticulous verse is the perfect vehicle to convey the devastating fragility of racial and familial identity in an America where interracial love is still divided through the problem of the color line. Readers will join Nelson’s protagonist in quietly hoping for that healing, too. Quiet for more than 135 years, the voices of Seneca Village are rising again. Angela Riddles ponders being free-but-not-free. The orphaned Donnelly brothers get gold fever. A conjurer sees past his era and into ours. Drawing upon history and her exquisite imagination, Marilyn Nelson recreates the long lost community of Seneca Village. A multi-racial, multi-ethnic neighborhood in the center of Manhattan, it thrived in the middle years of the 19th century. Families prayed in its churches, children learned in its school, babies were born, and loved ones were laid to rest. Then work crews arrived to build Central Park, and Seneca Village disappeared. Illustrated in the poet’s own words — with brief prose descriptions of what she sees inside her poems — this collection takes readers back in time and deep into the mind’s eye of one of America’s most gifted writers. Included as well is a foreword that outlines the history of Seneca Village and a guide to the variety of poetic forms she employs throughout this exceptional book. A powerful and thought-provoking Civil Rights era memoir from one of America’s most celebrated poets. Looking back on her childhood in the 1950s, Newbery Honor winner and National Book Award finalist Marilyn Nelson tells the story of her development as an artist and young woman through fifty eye-opening poems. Readers are given an intimate portrait of her growing self-awareness and artistic inspiration along with a larger view of the world around her: racial tensions, the Cold War era, and the first stirrings of the feminist movement. A first-person account of African-American history, this is a book to study, discuss, and treasure. Conjuring numerous voices and characters across oceans and centuries, Faster Than Light explores widely disparate experiences through the lens of traditional poetic forms. This volume contains a selection of Marilyn Nelson’s new and uncollected poems as well as work from each of her lyric histories of eighteenth-, nineteenth-, and twentieth-century African American individuals and communities. Later pieces range from the poet’s travels in Africa, Europe, and Polynesia, to poems written in collaboration with Father Jacques de Foiard Brown, a former Benedictine monk. Both personal and historical, these poems remain grounded in everyday details but reach toward spiritual and moral truths. Abba Jacob is a monk who lives on a far, far away island with his loyal rat terrier, Snook. Every day, from the wee hours of dawn till the sun sets over the sea, Snook keeps Abba Jacob company as he prays or works, tending the gardens or fixing the plumbing of the little hermitage he calls home. But when the two are separated by a ferocious storm, Snook must learn to fend for himself in the wild, all alone in a world of fierceness and wonder. Will he ever again hear the loving voice that he waits for? Simply and lyrically told by award-winning poet Marilyn Nelson and beautifully illustrated by Timothy Basil Ering with wit, warmth, and affection for the natural world, this captivating tale of friendship lost and found conveys the power of faith against all odds. A faithful little dog must survive on his own in the wild in this evocative tale of loss and reunion from acclaimed poet Marilyn Nelson and the inimitable Timothy Basil Ering. In the 1940s, as the world was at war, a remarkable jazz band performed on the American home front. This all-female band, originating from a boarding school in the heart of Mississippi, found its way to the most famous ballrooms in the country, offering solace during the hard years of the war. They dared to be an interracial group despite the cruelties of Jim Crow laws, and they dared to assert their talents though they were women in a “man’s” profession. Told in thought-provoking poems and arresting images, this unusual look at our nation’s history is deep and inspiring. Illustrations by Jerry Pinkney. Four casks of rum and a bolt of calico. and stowed.) Four casks of rum and a piece of cloth. disappeared. A business venture took his place. harmed past healing by the cheapening of human life. the chains. Venture. There were whole worlds to gain. to frescoed Renaissance cathedral walls. the sky, elbow each others’ ribs, and groan.